My husband and I are big baseball/softball fans. We've both played these sports since we were little kids and even went on to play in college for a bit. So it's no surprise that we'd like Riley to follow in our footsteps and develop a love for "America's National Pastime" too. Learning the basic motor skills associated with baseball are key, such as keeping your eye on the ball and following it into your glove, and now thanks to Melissa & Doug, Riley can start developing this level of coordination in a fun and easy way. The Froggy Toss & Grip toy from the Sunny Patch collection is a great way for children to develop their large motor skills by playing a good ol' fashion game of catch. Keep reading to learn more about an inexpensive toy that can be played both indoors and out and is guaranteed to cause plenty of giggles! I reviewed the Froggy Toss & Grip from Melissa & Doug which retails for $12.99, but is currently on sale for $10.45 with FREE SHIPPING at Amazon.com. From bubbles to beach toys, Sunny Patch indoor and outdoor toys from Melissa & Doug are all about adventure and exploration! Enjoy warm-weather fun with pool toys and water games, make imaginations grow with kids' gardening tools, and build creativity with sand toys that make much more than castles. Raincoats and boots for kids make rainy days playful, too. Wherever imagination leads, Sunny Patch inspires families to play outside, laugh out loud and love spending time together. Froggy is Sunny Patch's most famous swim instructor. You'll find him leading his tadpole students in their daily drills swishing through ponds and leaping onto lily pads. 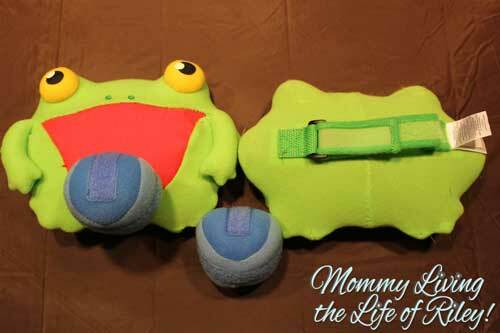 But in the Froggy Toss & Grip game, Froggy is busy teaching your little one to catch. Preschoolers must really watch the ball coming towards them and then rush to get their mitted hand in the vicinity of the self-stick ball. If they get close enough, they will be rewarded as the ball is "caught" in Froggy's mouth. Riley couldn't get enough of this game and because of the soft plush ball and mitts, we were even able to play indoors. Every time I tossed the ball to her and she caught it, there were squeals of delight. She also seemed to get equally excited when I caught her wild pitches. The hook and loop tape really sticks to the Froggy mitt too so that if it barely touches, the ball will "catch". This posed a little bit of a problem for my 3.5 year old, who found it hard to pull the ball from the mitt at times. 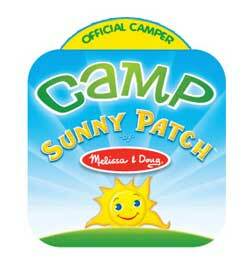 Get your child outdoors and active this summer with Melissa & Doug's Sunny Patch toy collection and watch their happiness grow! Disclosure: I received the Froggy Toss & Grip from Melissa & Doug in order to facilitate my review. No other compensation was received. This product review is based on my own personal experiences with this item and is completely honest and objective. My little one would also love the Happy Giddy Bowling Set. we’d love the Happy Giddy Bowling Set. My kids would like the Spark Shark Fish Hunt Pool Toy. I love all of their old fashioned wooden toys, I collect old snoopys’ lol. This would be great for hand, eye. Thanks, its a cute set. We think the Spark Shark Floating Target Pool game Looks like Great Fun! I like the sushi slicing playset. Thanks for the chance. The kids would also love the Spark Shark Floating Target Pool Game. We’d also love the Blossom Bright Kid’s Sprinkler to stay cool! The Happy giddy bowling set. bella butterfly bubble set for sure!! I see it has been said already. But, I also like the Happy Giddy Bowling Set. My boys would love the Tootle Turtle Target Game. Thanks so much for the chance to win! My son would love the Happy Giddy Bowling set! The Happy Giddy Bowling Set looks like fun. Seaside Sidekicks sand cupcake set! 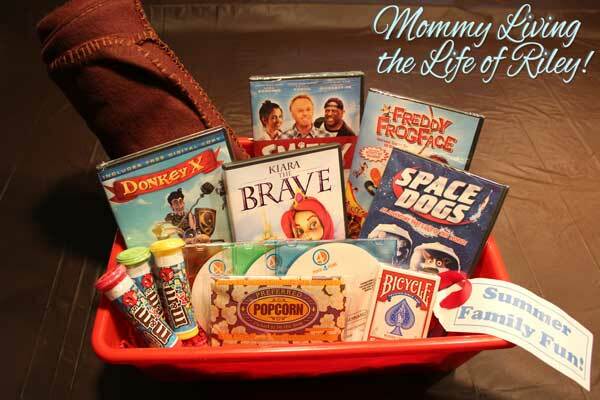 I think my daughter would love it! The Seaside Sidekicks Sand Cupcake Set looks very nice!